EARLY REGISTRATION for the December 06, 2015 Pageant is only $149 until October 24, 2015. More info. Our pageants gives every child from newborn through 18 years of age a magical day in a ballroom setting. We do crown every child as we feel their self esteem is the most important. We make every child feel accomplished. This is a no pressure Pageant. You need no talent or talking. NO MAKE UP, NO FAKE TANS, NO FAKE TEETH, NO FAKE HAIR. Just a pretty little face. We are looking for a child image next door. There are ten age groups. In each age group there is a Princess, Queen and a Little Miss Nevada, all others will be crowned a Jr. Princess. We do have boys. Titles are Prince, King and Little Mr. Nevada. Then we have our fun teen and Pre teen titles Miss Nevada state, Teen, and Preteen. (pre teens and older can wear make up). Each contestant will be in the magazine. Each contestant will come out on stage twice. NO WORRIES WE SHOW YOU THE MORNING OF THE PAGEANT EXACTLY WHAT TO DO IN A PRACTICE. You need two outfits. One pretty little dress or slacks and a fun outfit of choice. (cowboy, Tinkerbelle, princess something fun). Our judges are told do not pick the most expensive dress. This pageant is designed to have fun. You can wear a Sunday best dress, flower girl dress, a pageant dress any pretty dress you want. The judges are judge on it fits properly and complements the child. We are looking for a happy, fun beautiful child. You can also for $35.00 put in a good luck message and I love you message in our magazine if you would like. Put your $40.00 deposit down now to hold your crown. Once we run out of crowns we will close the pageant. The balance of 219.00 is due 10 days before the pageant. With a picture of the contestant emailed to madsmom3@cox.net. Please make sure the picture is not in the body of the email, we need it as an attachment with contestants name in the body of the email. Our next pageant is our Limited Christmas Dress Pageant on December 6, 2015. There will only be one walk in a Christmas dress or holiday outfit. Our Christmas pageant does not come with a magazine like our September pageant, but Santa will be there for them to get there holiday bag of goodies. Come join the fun. 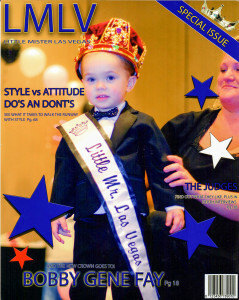 You could be the next Little Miss or Mr. Nevada. If you have any questions please email Tami at madsmom3@cox.net or call (702) 688-0268.